Hello UESPWiki. My name is LaJaveyon Saunders and I have been an avid player of The Elder Scrolls series for several years now. I started with the first game Arena, which was also my first PC game. Since then I have played all of the main games and spinoffs, along with the mobile Travels series. In (and sometimes out of) the TES world, I am an Argonian. They are my favorite race in the TES Series, and I can't wait until Black Marsh recieves it's own game. 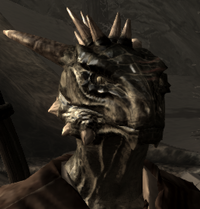 I play as members of the same Argonian family clan, known as Vel, in every TES game (except Battlespire and Redguard of course. They are still awesome to me though). I can't wait to meet and discuss with all of you pretty soon. Good morning, Good evening, and Good night. I am currently writing an TES Novel that takes place twenty years after Skyrim. You can read it Here. I'm a Loremaster, but I prefer to edit pages about the Argonians, Black Marsh, the Hist, and things that refer to them in general. So if you see me editing, that's what I'm editing. "I Lick The Sap, Not Deal With The Crap." This page was last modified on 10 December 2013, at 18:21.